Relaxing is easy in the Mountain Highlands. 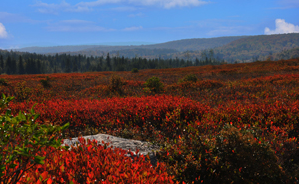 Explore the amazing countryside at Blackwater Falls … where spring wildflowers, beautiful fall foliage, and deep winter snows attract visitors year-round. 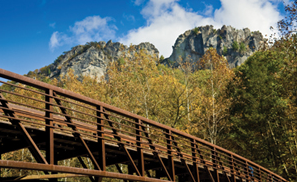 Visit the 300-year-old Seneca Caverns or the 900-foot-high Seneca Rocks formation – one of the best rock-face climbs in the East. 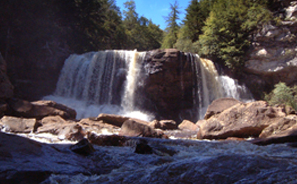 Many observation points along the trail to the falls in Blackwater Falls State Park afford you panoramic views of the half-mile wide canyon. The black water is a result of leached tannic acid from fallen hemlock and red spruce trees. The falls are one of the most photographed sites in West Virginia. The nation’s 500th refuge was dedicated in 1994 and its 16,225 acres are managed by the United States Fish and Wildlife Service. The land in the northern sector of the valley are protected to remain wild forever. 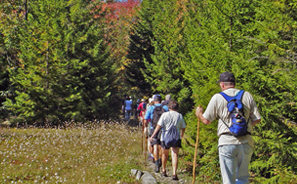 Visitors can enjoy interpretive hikes, 31 miles of year round trails, hunting and fishing opportunities and a visitor center with educational exhibits, films and displays. 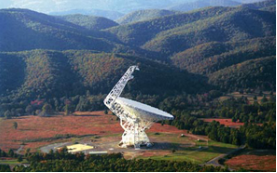 The 10,215 acre property is located on the Allegheny Plateau, part of the Allegheny mountain range. The plant life is unique in that it is normally found in areas much farther north, like Canada. Flowering plants (May – Early July) that can be found include rhododendron, mountain laurel, and wild azaleas. Open year round (except during winter storms, visitors should use caution as storms develop rapidly) offering breathtaking views, scenic overlooks, hiking trails, a picnic area and camping area. 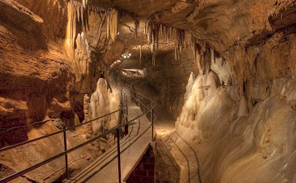 Located in the scenic Germany Valley, offers two guided caverns for touring. 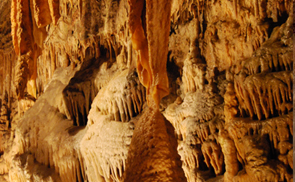 Seneca Cavern is a guided, 1 mile tour with light. The Stratosphere Balloon Cavern is more adventurous, with no electricity, and portions of the path require use of a rope (cemented in place along the path) and some steep slopes. Family activities such as gemstone mining, miniature golf, and restaurant facilities offering lunch in the dining room or porch overlooking the valley. Picnic areas and shaded pavilion available. A 900-foot-high formation with a visitor’s center at the base. Take rock climbing lessons and scale the mountain, or non-climbers may reach the lofty heights of the rocks and view the scenic valley below by taking a steep 1.3 mile trail up the west side of the mountain. Tours offered year round. Magnificent formations are the results of millions of years of intricate processes and trillions of drops of mineral laden water seeping through the limestone bedrock which leaves trace mineral deposits that over millions of years creates spectacular stalactites, stalagmites, helictites, flow-stone, columns and dazzling multi-colored formations that you will see in the WV Underground. 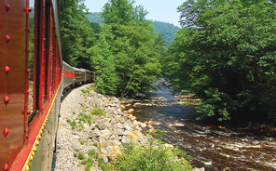 Enjoy 4 scenic rail excursions into the heart of the scenic West Virginia Mountains. 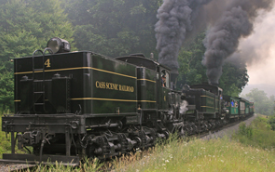 Enjoy an adventure on the steam-powered Durbin Rocket, the New Tygart Flyer passenger train, the Cheat Mountain Salamander, or the Mountain Explorer dinner train. Their main depot is located adjacent to our shop in Ekins, WV. Featuring old logging trains pulled by Shay Engines, restored as a living museum of railroading and lumbering. 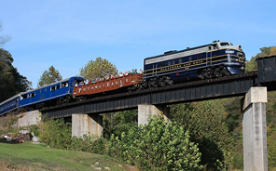 The train operates from Memorial Day through Labor Day and on fall foliage weekends in October. Located in Cass, WV. 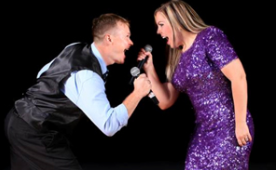 The Gandy Dancer Theatre Show is a great time for every member of the family. Dinner is included for all shows and is served prior to the performance. Located in Elkins, WV. A diesel-powered, open-window coach train. A 3.5-hour round trip takes you through the South Branch, where you might see a soaring eagle. Located in Romney, WV. Thrilling summits, unforgettable views & family adventures. 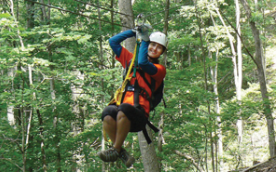 Via Feratta , Zip Lines, and West Virginia Rock Climbing. 877-435-4842. 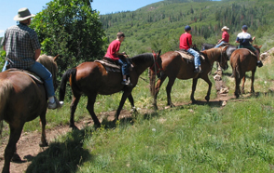 See the mountains of beautiful West Virginia from horseback while riding through Canaan Valley. A petting zoo and pony rides are available for youth. Offering an unforgettable excursion down West Virginia’s whitewater rapids along the mighty Cheat River. 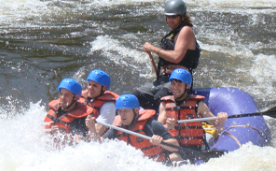 Big, adventurous rapids in the spring, family-friendly rafting throughout the summer.